Selectivity, hooks and smart fish? My very good friend, client and general pontificator of things piscatorial, Paddy Coleman, recently raised a very valid point about flies, selectivity and supposedly “educated” trout. He told me that whilst he would accept the idea that drag was a no no in terms of fly presentation, he couldn’t hold to the idea that trout became educated to the degree that they would “remember” or “refuse” flies based on past experience. Suggesting that were it the case, the hook would be a dead giveaway to a cerebrally sophisticated trout. “What about the hook”? Paddy expressed it with the addition of a brief and powerful, if perhaps not entirely socially acceptable, expletive but the message is clear and it he raises a valid point. If fish are so smart, why do they not shy away from the hook? Exact Imitation and its limitations. No matter what you do, the hook of course is the downfall of the “exact imitation brigade” because real insects don’t have them, although you could argue that the odd midge pupa is a pretty close copy. 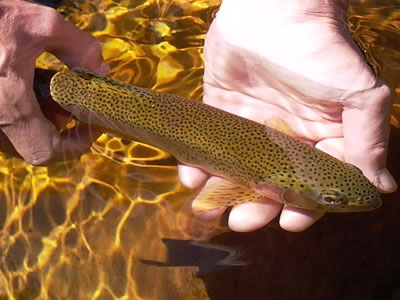 In trout angling the acceptance of the idea that trout are smart and close imitations are required is widely accepted. In fact to the point that it is rarely even questioned, but is it true, sensible or even effective to work along the lines of close copy imitations if they have, by default a metal spike sticking our of their nether regions? It often strikes me that it is normal that one can see one’s own fly on the water, but frequently in a hatch situation you cannot actually see the “real thing” even then. So our imitations are obviously not that exact there being a quantifiable degree of difference, even at a cursory glance between the angler’s imitation and the real thing. So how much of an issue is the hook, and is it worth going to extreme effort to hide or disguise it? Truth be told the hook sticking out of your carefully tied imitation is an anathema, surely if the trout are so picky then they would “Wise Up” to the presence of the hook and quickly become uncatchable? More to the point, if there was a simple and effective way of tying flies upside down, we would more than likely use them; if not indeed use them exclusively. There have been myriad attempts at getting the hook out of the water and therefore hopefully out of the trout’s gaze..
Goddard and Clarke in their excellent book “The Trout and the Fly” designed and “built” the USD dun, a wonderfully realistic upside down fly with curved wings of cut hen hackle, cleverly fashioned parachute at the “bottom”, read top, of the hook and absolutely nothing to give the trout a hint that all was not well. At the time it was hailed as a breakthrough but the darn things are so troublesome to manufacture that they have fallen out of favour to the point that I couldn’t find an image of one on the internet.. Although a close resemblance can be found in this pattern. Where the wing has been replaced with polyyarn or similar. The simplest version of an upside down dun fly was created by Niel Patterson as the “funnel dun”, this pattern uses the same hackle as regular Catskill tied or Halfordian creations, but it is forced into a cone or funnel shape, combined with the tail being tied markedly around the bend of the hook the fly has a distinct propensity to land “the wrong way up” thereby “hiding the hook point”. It is certainly much simpler to manufacture than Goddard and Clarke’s pattern, but I have to confess it lacks aesthetic appeal to my eye. (I have a soft spot for fishing with pretty looking flies I’m afraid). Then the most modern, and I am given to believe patented process of the Waterwisp patterns, flies tied using the bend of the hook as the post of a parachute hackle. The real innovation being simply that the hook eye is bent in line with the shank allowing the tyer to put the hook, eye first into the vice. One has to admire the innovation, although one suspects that these flies are not in wide use, and there are comments that the hook up rates are relatively poor compared to more standard imitations. So what does all of that prove? Not a lot, that fish might be smarter than we think? Or maybe not so, it certainly does demostrate that anglers are a pretty thoughtful and inventive bunch and I am sure it would be fun to keep experimenting. Still, thankfully the majority of fish don’t seem to be bothered by the hook and even Goddard and Clarke commented that they reserved their upside down (USD) patterns for “difficult or more educated fish”. Watch out for the next post, I am going to flex my brains a little and explore some thoughts on selectivity, but then again I have been wrong before..